The Nobel Prize-winning Russian poet and writer Boris Pasternak became world famous for his controversial novel Doctor Zhivago which underscores the plight of the Russian upper middle class during the Bolshevik Revolution. Pasternak was a great composer of images. His grand novel is full of humanism and Pasternak presents the character formation in a poetic vision. He saw the gigantic social changes of 1917 in a human kaleidoscope. Although the novel was written during the years surrounding the revolution (1910-1920), it was published several decades later. Pasternak’s vision of cosmology, and passion for the individual as well as for life splendidly written in this great novel. It is a snapshot into Russian life Russian Revolution and the early Soviet era of life. 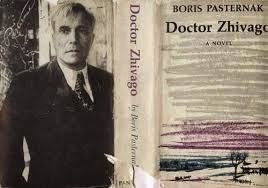 Pasternak highlights the problem of modern sociopolitical existence through his masterpiece Dr Zivago. It is a panoramic social and political chronicle, which describes the social turmoil during and after the Russian Revolution and how the Russian upper middle class was despondently affected by it. Pasternak’s revelation highlights a dramatic question. Is it fare to sacrifice personal freedom and personal life for a social ideology? The concept of ideology is most generally associated with power relations and often has no regard to human feelings. The ideology can be interpreted as the way in which people think about the world and their ideal concept of how to live in the world. It is a shared belief of a group of people, groups deliberately planning to oppress people or alter their ‘consciousness. In this process violence, torture and terror are used and people are judged by their ideological views. The Bolshevik Revolution had brought about a fundamental change in the organization of Russian society. The Bolshevik idea of “building a new man via social construction was an indigestible paragon for people like Uri Zhivago. Such people should adopt, perish or leave the system. When there is a dynamic social, change it, gives no place for personal feelings and everybody should get used to a collective life. Ideology and slogans become the center of life. People are judged politically. In such an environment, individuals are given less choices. Dr Yury Zhivago was one of the countless victims of such a system. The romance between Yuri Zhivago and Larissa Antipova was a personnel issue and it had no place in the Bolshevik concepts although Lenin enjoyed his private married life with Krupskaya and Stalin with Nadia Alliluyeva. Even though the Red hardliner Strelnikove states that, the personal life is dead in Russia it was not applicable for everyone. Uri Zhivago a doctor and a sensitive man dramatically torn apart by forces beyond his control. Dr Zhivago became a victim of a personal tragedy as well as a collective tragedy. Yuri’s mother died when he was a child, leaving him only a balalaika. Young Uri was adopted by his uncle. While living in Moscow he had a passionate interest in poetry. Doctor Uri Zhivago was recognized as a professional as well as a poet in the Russian society. But his life was torn between his two lovesTonia Gromyko his wife and Lara Antipova the beautiful nurse. When the Civil War erupted, Doctor Zhivago was forcibly removed from his wife and family by the Red Partisans and eventually his wife Tonia escapes to Paris with the children. When Strelnikove was arrested, Lara’s life was in danger and she was compelled to go with Victor Komarovsky –the immoral man and an opportunist. Thus, Dr Uri Zhivago lost Lara as well and becomes a fragile man. Lara disappeared off the street during Stalin’s Great Purge. “Perhaps in a labor camp,” narrated General Yevgraf, “A nameless number, on a nameless list which was later mislaid.” Love and innocence lost he was aimless. Dr Zhivago dies of a heart attack while pursuing a woman he believes to be Lara down a Moscow street. The collective tragedy fell upon on him with the Revolution. The bourgeois Moscovites grand lifestyle of enjoying champagne, caviar and vodka came to a hold with the Revolution. Their lives became topsy-turvy. Doctor Zhivago’s family wealth was confiscated and their house had been divided into tenements by the new Soviet Government. Zhivago’s family was confined to a small room. Dr Uri Zhivago was hated by the Bolsheviks because of his middle class bourgeois roots. His poetry was considered as lines of petty indulging verses. The revolution brought them misery and disappointments. Thousands were shot dead. The Revolutionary Committee could arrest or execute anyone labeling a counter revolutionary. Wealthy landowners were exterminated classifying them as Kulaks. There was no clear definition or a demarcation of a Kulak. A person owned thousand hectares of land was considered a Kulak. At the height of the state terror under Joseph Stalin, a farmer owned two pounds of grain also labeled as a Kulak and executed. Pasternak passionately renounced the Bolshevik idea of “building a new man” according to the Revolutionary measurements. Pasternak knew it was against nature. He argued that you could cut the tumors of injustice, which is a painful operation, provided that the patient should be kept alive. The novel Dr Zhivago is a saga, spanning Zhivago’s life depicting several authentic characters.Boris Pasternak adored the poet Alexander Block Dr. Zhivago may have been based in part on the real life Russian poet Alexander Blok who was the most famous and influential in Russia. Alexander Block was a symbolist poet who sought to convey individual emotional experience through the subtle, suggestive use of highly metaphorical language. In the years after the revolution, Blok was very involved in social and political journalism and in criticism. Blok’s disillusionment with the Soviet bureaucracy and censorship is suggested in his fierce and eloquent essay in 1921 “On the Poet’s Calling” Blok died in Petrograd on Aug. 7, 1921 at the age of thirty-seven. Like the fictitious character, Dr Uri Zhivago Block died under physical and emotional exhaustion and with a great disillusionment. The second character Pavel Antipov or Strelnikov’s personality is much similar to Leon Trotsky (Lev Davidovich Bronshtein). Pavel Antipov was a son of a railway worker. He marred Lara and moved to the Urals. He joined the army as a volunteer during the World War One and fought in the German lines. Wounded in the battle Pavel Antipov was presumed dead but later returns, using the pseudonym Strelnikov with a total personality change. He was not a warm caring man anymore, turned in to a bloodthirsty military commissar. Like Pavel Antipov, Trotsky was against the Bolsheviks in the early stages but later deeply embraced the Bolshevism. Leon Trotsky formed the Red Army that fought with the White Guard in the Civil War. Leon Trotsky spent his time during the civil war in a train traveling widely across the young Soviet Union. According to the novel Pavel Antipov alias Strelnikov was a ruthless character who travels by a special guarded train destroying villages and eliminating people who help the Whites. When Dr Zhivago accidentally encountered Strelnikov’s well-protected locomotive he was arrested and taken before Strelnikov. When Strelnikov sees Dr Zhivago he immediately recognizes the famous Russian Poet. These were the words of Strelnikov when he denounced Zhivago ’s poetry. I used to admire your poems. I shouldn’t admire it now. I should find it absurdly personal. Don’t you agree? Feelings, insights, affections… it’s suddenly trivial now. You don’t agree; you’re wrong. The personal life is dead in Russia. History has killed it. I can see why you might hate me. Leon Trotsky and Strelnikov shred a common fate. Both of them fell from grace. he Bolsheviks relinquished both. Strelnikov committed suicide while he was taken to a firing squad and Trotsky was murdered in Mexico. Yevgraf Zhivago is another Character Pasternak introduced in this novel. According to the bookYevgraf was Dr Uri Zhivago ‘s younger illegitimate half-brother who was working for the Cheka.Cheka was a secret police force that was founded soon after the Revolution. Cheka had power to arrest people. No judicial process was involved in assessing the guilt or innocence of any of its prisoners. Punishments, including the death penalty, were arbitrarily applied. The Cheka was granted the power of summary trials and execution of death sentence. There are much resemblance between Yevgraf Zhivago and Felix Dzerzhinsky – the founder of Bolshevik secret police the Cheka. Dzerzhinsky was not a Russian, he was a Polish. InPasternak’s book Yevgraf Zhivago was illegitimate (non Russian ?). Like Dzerzhinsky, Yevgraf Zhivago combats internal political threats executing suspects. Yevgraf Zhivago ‘s words correspond to the power that Cheka members had. Indeed as a policeman I would say, get hold of a man’s brother and you’re halfway home. Nor was it admiration for a better man than me. I did admire him, but I didn’t think he was the better man. Besides, I’ve executed better men than me with a small pistol. Cheka became ill famous for large-scale human rights abuses, including torture and mass summary executions, carried out especially during the Russian Civil War. Lieutenant Razin could be Kliment Voroshilov who was the commissar of the 1st Cavalry Army and later became the People’s Commissioner for Military and Navy Affairs and Chairman of the Revolutionary Military Council of the USSR. Voroshilov gave his full support to Joseph Stalin’s 1930 Great Purge, denouncing a large number of his colleagues who served in the Army. John Locke and Jeremy Bentham described society as comprising individuals interacting through market relations. However, Bolsheviks went further and wanted to create a socialist Utopia through revolution and subsequently via Stalinism. Nonetheless, Pasternak viewed it as a colossal social upheaval caused millions of human lives in Gulags or slave labor concentration camps that became a symbol of tyranny and oppression. Pasternak’s novel Dr Zhivago was banned in Russia for 30 years when he attempted to publish in 1957. As the protagonist of the novel, Uri Zhivago Pasternak was once considered by the system as a misfit. He was persecuted by the Soviet authorities as a traitor. Pasternak won the Nobel Prize for Literature in 1958, but he was compelled to deny it following the pressure put by the Soviet regime. In 1987, the Union of Soviet Writers posthumously reinstated Pasternak.Doctor Zhivago was finally published in Russia in 1988 after the collapse of the Soviet Union. Pasternak left us with moral questions that are convoluted to find answers. But words of Alexander Berkman coincide Pasternak’s inner thought about the revolution.